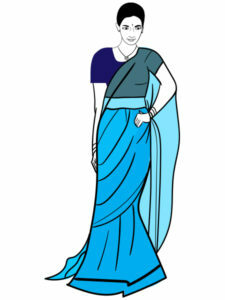 Follow our step by step process on how to wear a saree in less than 3 minutes. This tutorial illustrates a unique technique for saree draping & wearing style. Ensure that you’re wearing the petticoat that matches the saree color and is firmly tied at the waist. You’re going to tuck most part of your sari into it, so thus, this needs to be perfect. Note: If you plan to wear high heels, do that before you start draping. As this will get you the ideal length and prevent you from tripping over your own pleats. Start from the plain end, and tuck in the fag end just near where the belly button is. Continue to swaddle from the left side and complete the round from behind till you reach the point where you first started. Yank the saree to the front & begin making the pleats roughly around the size of the finger stretch from forefinger to your thumb. Make anywhere between 5-7 pleats, depending on the material. Tuck the pleats into petticot and secure it with a safety pin towards the left side of the waist. This trick will help your saree stay intact when you move around. This leaves you with the pallu. You now have a choice of either letting it flow or pleat it together. For a floating look, all you need to do is bring the pallu towards the left side of your shoulder, i.e from under the right arm, and pin it on the left side of your shoulder. Hold it either at the forearm or leave it until the end. For the pleated look, bring the pallu from under the right arm to make vertical pleats (which is about 5-6 inches) with the border (if any) being the first pleat. Then continue along the breadth of the saree. Now, pin it near to the left side of your shoulder, but do ensure that there is at least one meter left.